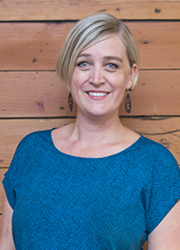 Jessica Farrow - Registered Massage Therapist On Fraser St, Fraserhood. Jessica is not currently accepting new patients, apologies for any inconvenience. I am the proud owner and creator of Honey + Garlic Health Studio! I wanted to build a clinic where style and character have not been sacrificed in the antiseptic name of wellness. I wanted to find the balance between beauty and function, and work and fun, with a touch of the quirky and unusual thrown in just to keep it its own. Being a therapist myself, I also wanted to create a clinic in which the therapists feel supported and valued. I chose to open a multi-disciplinary clinic because that’s where I like to work the most; I love getting to be a part of a team, especially a team of varying talents and knowledge bases, but at the same time having my own practice. I also chose to offer a variety of treatment options because I frequently find that to really get to the bottom of an issue you need to tackle it from as many angles as you can. I became a registered massage therapist in Vancouver in March of 2009. Before that I lived in Montreal for a time and finished a bachelors in Art History, which obviously led to a career in health care! I chose massage because of my interest in anatomy and the workings of the body, and because of my fascination with the connection between the body and emotion. Also, I like to figure things out and solve puzzles. I quickly realized I prefer my puzzles to have concrete answers, which is often not the case with massage. But I learned to let that go and just concentrate on what my hands are telling me. I love the immediacy of massage, the directness. There are not too many professions out there where you get to have such a direct and hopefully positive impact. I was also drawn to the one-on-one aspect of massage and what I like to call the “bartender” effect; getting to hear all those wonderful and sad and wild tales. But the longer I am in this profession the more I find I simply enjoy getting to be a support for another individual; whether it’s to lend an ear, be a source of information or just to be a pair of hands working out the knots. I utilize a variety of massage modalities, from deep tissue massage, fascial work, and trigger point therapy, to joint mobilizations. Like most RMTs I have treated a wide range of conditions but I must say I feel I have a greater affinity for the classics: headaches, neck and shoulder pain and good old lower back pain. I grew up on the island, in Victoria. I’m a horse back rider and can’t say how much horses have enriched my life and character, as cheesy as that may sound. I love movies and books and reading in cafes. I wish I was more of an outdoors-woman but can’t quite seem to make that a reality. I have some really fantastic friends who have supported me through this whole clinic process, from fixing my Photoshop files all the way across the country to helping me paint chairs white and build bookcases. And I am fortunate to have about the most supportive family you could ever imagine. (And a lovely cat who’s trying to “help” me type right now). Please note that I am not currently accepting new patients. I apologize for any inconvenience.